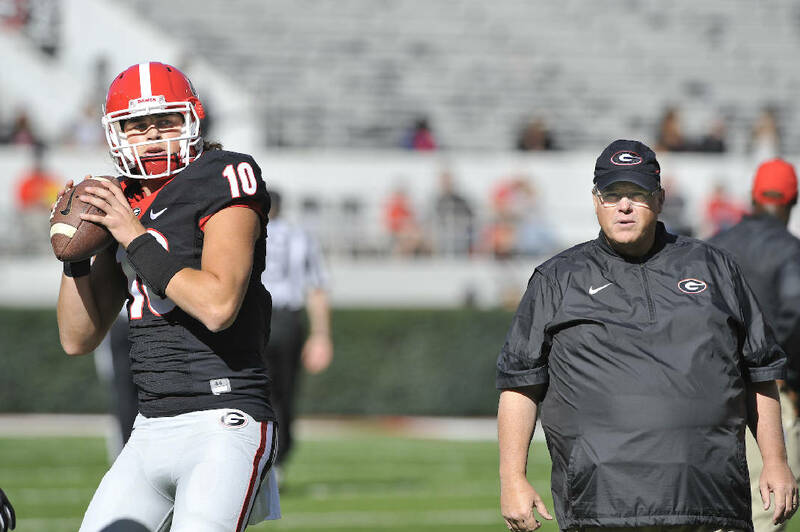 Georgia sophomore quarterback Jacob Eason and second-year coordinator Jim Chaney will try to enhance an offense that ranked just 11th in the SEC last season with 24.5 points per game. Georgia will begin its second preseason football camp under coach Kirby Smart on Monday afternoon, and there is no shortage of optimism surrounding the program. Starting with the coach himself. "I feel good about the competitive makeup of this team," Smart said. "I don't know how the offensive line is going to shake out depth-wise, because there is a lot of competition there. There are a lot of young guys who are going to walk into our secondary and be on the second team, and maybe one of them beats an older guy out. "I do know that they will fight you and compete, because I see it every day in the weight room. I've been around this team more this summer than I've ever been around a team, and we know these 25 freshmen are going to have major impacts. I'm excited about those guys." Georgia struggled throughout much of Smart's first season in Athens, losing to Vanderbilt and Georgia Tech in the same year for the first time since 1961. A 17-16 home setback against the Commodores was followed two weeks later by a 24-10 loss to Florida in Jacksonville that saddled the Bulldogs with a 4-4 record. They were in danger of missing out on a bowl for the first time in 20 seasons, but they closed with four wins in their final five games, with a 28-27 home loss to the Yellow Jackets the exception. Georgia has eight returning starters on offense, including sophomore quarterback Jacob Eason, who Smart clearly has stated heads a depth chart that includes touted freshman Jake Fromm. "We'll continue down the road that we went through this spring," said Smart, who was a recent guest of "Press Row" on Chattanooga's ESPN 105.1 FM. "Both of those guys got reps, with Jacob working with the ones primarily. He had a lot of success moving the ball. Jake Fromm did a good job with the twos, and the good news is we're going to find out more about Jake, because he is going to be playing against a better No. 2 defense. "We had no scholarship DBs at the (second-team) corners in the spring after Mecole Hardman moved over to receiver. Now Jake will be going up against four or five really good freshmen in the secondary who should create a better competition there. We'll see how Jake does with that." The offense is headed by the senior tailback tandem of Nick Chubb and Sony Michel, who combined for 1,970 rushing yards last season, but senior guard Isaiah Wynn and junior guard Lamont Gaillard are the lone returning starters on an offensive front Smart hopes will be bigger and more effective this year. The offensive line is expected to be the most intriguing aspect to preseason camp, with five-star freshman tackle Isaiah Wilson joining the competition. Wilson is 6-foot-7 and weighs 350 pounds, and he's part of a massive incoming contingent that includes Netori Johnson (6-4, 334), Justin Shaffer (6-4, 350) and Andrew Thomas (6-5, 338). "It's hard to change what you've got," Smart said. "You can be so big if you're so big, so you can't take Isaiah Wynn (6-2, 302) and make him 6-5. Isaiah Wynn is a really good football player, but he's just not real big. What we've been able to bring in I've been pleased with, and we'll see if they're ready to go compete against these guys who have a little bit more knowledge. Let's see if they have the fight and the tenacity to be ready. "To walk in and be a freshman O-lineman in the SEC — we looked last year, and there were four kids who started as true freshmen. It just doesn't happen very often, so we're going to have to grow these kids up really quick if they're going to help us this year." The Bulldogs will be favored to sweep their Sanford Stadium schedule of Appalachian State, Samford, Mississippi State, Missouri, South Carolina and Kentucky. It's the six games away from Athens — Notre Dame, Tennessee, Vanderbilt, Florida, Auburn and Georgia Tech — that likely will determine whether they have another season in the eight-win range or achieve something really special. Georgia has been picked to win the Southeastern Conference's East Division, but that was the case in 2013 and 2015 as well, with the Bulldogs coming up short to Missouri and Florida in those particular seasons. "We're just focusing on Georgia and not paying attention to what's going on around us," Chubb said. "We're just going to take it one step at a time and one day at a time. We're going to build our team up and go at it."